You want me to think OUTSIDE of the box??? How did this end up way down in 17th...? Man, I guess that is what happens when I don't vote. Great shot. Very pleasing: just the right amount of everything to say exactly what it says. Technicals are great on this one. Someone needs her nails clipped! I like the hay; was that a bribe? 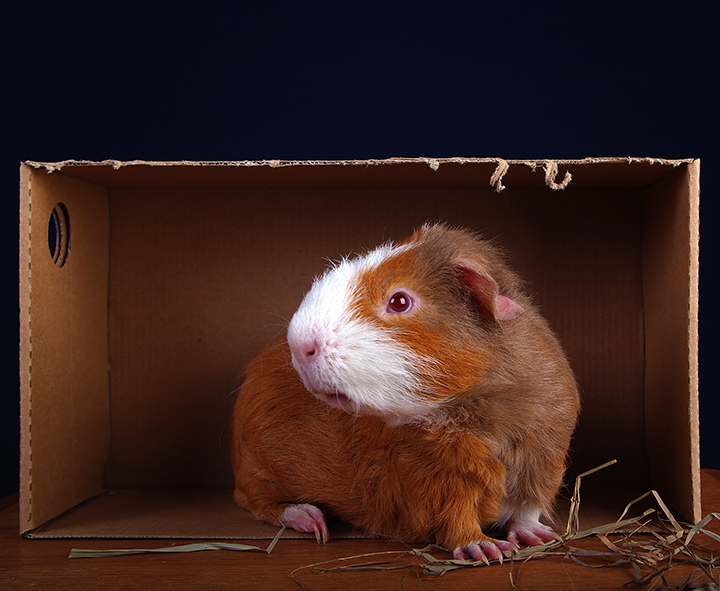 I would think the box would be enough, as any self-respecting guinea pig would be happy to munch on it. She does look a bit puzzled and the pose with her head turned is actually quite lively for a piggie pic. The rough edge on the top of the box adds interest. Atonal browns are nice for this shot. Oh! What a lovely piggie! I absolutely LOVE the pose as the face, being white, contrasts over the back of the body instead of visually blending in which would probably happen if the hair were all the same color. Not to mention the pose looks so curious and alert. I had a pig and he did not get any of the plastic igloos, but boxes to play in.. so this brings back memories. And I love the addition of the hay - it makes it look as though the piggie is right at home in your photo. I maybe wish some of the top had been cropped off - it isn't horrible there or anything, just a bit unnecessary to me. Oh, and another thing! Pretty good detail in the white hair and good job eliminating the red-eye problem. And.. I like the lighting because it emphasizes the face, and it seems elegant and dramatic. Okay, I'm rambling... I just love guinea pigs and your photo is very nice!! Proudly hosted by Sargasso Networks. Current Server Time: 04/25/2019 08:12:13 AM EDT.